The Internet might seem intimidating at first – a vast global communications network with billions of webpages. But in this lesson, we simplify and explain the basics about the Internet using a conversational non- technical style to make it understandable, useful, and enjoyable. There’s no reason to be left out! The Internet, the web, cyberspace, and the ‘net are all terms that generally mean the same thing, in this case, we will call it the Internet. The Internet is a NETwork of computers, all over the world, INTERconnected to each other and available to any individual. The Internet is used for many different activities including shopping, communicating, learning, and distributing information. Unfortunately, you cannot open a door to a house and walk outside to “go into the Internet.” Computers are a primary tool you’ll utilize to use the Internet. The Internet is somewhat difficult to describe because you cannot touch it (in a way similar to software). It seems invisible—only computers can see it – and you can see it through a computer. Sometimes the Internet is best described in comparison to a library. The Internet is made up of many individual components, just like a library is made up of many books. The Internet’s components have even more individual parts, just like a book has pages. The Internet is a useful source of information about news, sports, and entertainment because it changes along with the minute-by-minute events that occur in the world brings. This might seem confusing. However, it is not necessarily so—the Internet can be thought of as a “dynamic” living organism that changes and adapts to its environment. The Internet changes very quickly—just watching a 24 hour news channel on the television. The content on some websites is updated every few seconds. On the Internet, there are many websites. These are usually made for one specific purpose; they range from informing you about the news to teaching you how to cook. The best analogy of a website is a comparison to an entire book or an entire newspaper. Websites are made up of “pages,” just like newspapers and books. Websites are usually independent, however sometimes they are linked together by hyperlinks (also called links) that allow you to jump from one website to another website. These links allow you to “turn the page,” and move around on the Internet. They are usually underlined and blue, however they can be any color and or even a picture. How do you identify a hyperlink? When your mouse hovers over a hyperlink, the arrow changes into a pointing hand. Webpages are what you see and read on the Internet. They are primarily made up of text (words), digital media (pictures, movies, and music), and hyperlinks. The Internet, unlike a book or newspaper, is in no order, and can seem slightly confusing at first. However, there are tools on the Internet that help organize it and will allow you to use it comfortably and easily. On the computer, you use a program to see the Internet. The program is called a web browser — you “browse” the web with it. Some common brands of web browsers include Internet Explorer, Firefox, and Chrome. They serve the same purpose, navigating the internet, and also have many of the same buttons. For instance, we will take a look at a generic browser’s buttons. You will use these buttons to navigate around the Internet. Sometimes extra buttons might be added, while other times, buttons might have been moved around on the toolbar. If you cannot find a button, just ask someone (they seem to be pretty tricky when they hide from you). The Back Button – This button allows you to return to the last webpage that you last visited. It is most often used if you accidentally click on a link and wish to return to your previous page. The Forward Button – If you clicked the back button, you don’t have to hunt for the hyperlink on the webpage to return to the previous webpage. Just click on the forward button to return to the previous page that you were at before you pressed the back button. The Refresh Button – This button is useful if you are looking at pages that contain content that is updated more frequently, such as the news, sports scores, or the weather. By clicking on the refresh button, the web page loads again, and is updated with the latest information. The Home Button – When you open your web browser, the first website that is displayed is your homepage. You can change your homepage to fit your preferences. When you click on the home button, it takes you to your homepage. The Address Box – This displays the URL of a webpage. URL stands for Universal Resource Locator, which is a unique address for each webpage – just like your own home’s address is unique. You can type a specific URL into the address box by left clicking in the box once and then typing. Although URLs are all different, they share common characteristics. 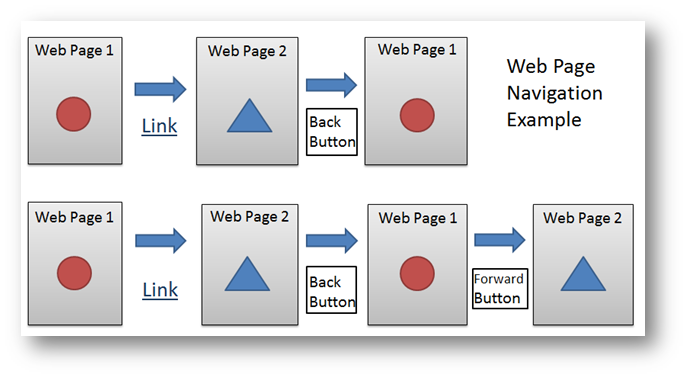 The basic diagram of a URL is shown below. One thing to keep in mind when viewing the Internet is that a bunch of information might be displayed on a webpage, however, only a small portion can be seen immediately when you load the webpage. Thus, it is important to look at your scroll bars to the right and bottom to see if there is more information you are missing. If you are tired of using the mouse to scroll up and down, try using the arrow keys. On the Internet, there are things that help you and things that can make you aggravated. One aggravation is the Pop Up Ad. These advertisements are created by aggressive marketers who want you to see their “amazing” product and buy it. Pop ups create their own window and usually appear on top of the information that you are interested in. If you click on a pop up ad, it will take you away from the information you are looking at. If you see a pop up ad, click the X at the top right of the window to close it. Another type of advertisement is the Banner. Banner ads show up at the top of a website or on the side of a website. As a beginner, it’s generally wiser to ignore banner advertisements unless you are familiar with the company. Because there are so many things on the Internet, it is frequently hard to locate exactly what you are looking for. Search engines such as Google (www.google.com) are very helpful and allow you search the Internet. A search engine is a Website used to search for information on the World Wide Web. Google first collects websites using a computer program (called a wanderer, crawler, robot, worm, or spider). Then Google creates an index of these sites so they are searchable. There are many search engines that are available – we use Google for purposes of instruction because most people use it. 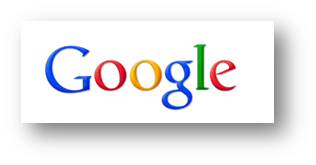 Go to Google by typing www.google.com in the URL address box (see page 5). Google is also one of the fastest search engines and provides some of the best results. Next type your topic or key words (words closely related to your topic) into the box under the Google logo. The next page that will appear is your search results page. This page lists the first few results from your search. Click on one of the page title that has an interesting description or seems most relevant. If you are not satisfied with that website, click the back button and try a different website. If you still cannot find a good website, try searching by using different terms in the search box at the top of the webpage. The “I’m Feeling Lucky” button will take you directly into the first Website on the list of results. The more words you include in your search, the more specific your search will be and the more relevant your search results will be. Browser – A software program that allows Internet documents (like webpages) to be viewed, also called a Web Browser. Cyberspace – The world of computer networks. Domain Name – A unique name that identifies a specific computer on the Internet. Download – A term for transferring software or other files from one computer to another. Email – Electronic Mail – Messages sent from one specific user to another using the Internet. Home Page – The first page of a Website, similar to a table of contents. HTML – HyperText Markup Language- A computer language used to make hypertext documents that are sent via the World Wide Web and viewed using a Browser. HTTP – HyperText Transfer Protocol – The way that hypertext documents are transferred over the Internet. Hypertext – A way of presenting information that allows words, pictures, sounds, and actions to be inter-linked so that you may jump between them however you choose. Link – A word, phrase, or image that allows you to jump to another document on the World Wide Web. Search Engine – A website that indexes and allows searching of information gathered from the Internet. Google is an example of this. Webpage – A hypertext document available on the World Wide Web. Website – A collection of webpages. World Wide Web – A collection of resources available on the Internet using a web browser.